Updated: 7:04 p.m. | Posted: 5:56 a.m.
Floodwaters reached the rooflines of single-story homes Monday and people could be heard pleading for help from inside as Harvey poured rain on the Houston area for a fourth consecutive day after a chaotic weekend of rising water and rescues. 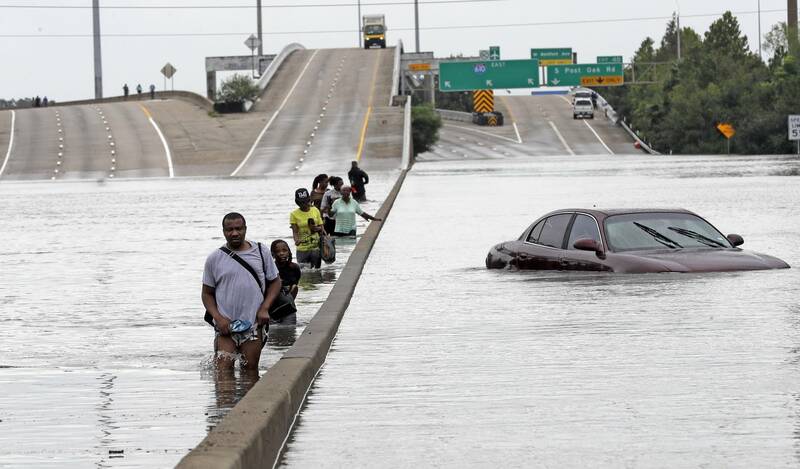 The nation's fourth-largest city was still largely paralyzed by one of the largest downpours in U.S. history. And there was no relief in sight from the storm that spun into Texas as a Category 4 hurricane, then parked itself over the Gulf Coast. With nearly 2 more feet (61 centimeters) of rain expected on top of the 30-plus inches (76 centimeters) in some places, authorities worried about whether the worst was yet to come. The driver of the vehicle, the children's great-uncle, reportedly escaped before the van sank by grabbing a tree limb. He told the children to try to escape through the back door, but they were unable to get out. The city's normally bustling business district was virtually deserted Monday, with emergency vehicles making up most of the traffic. Most businesses were closed. Elsewhere, water gushed from two reservoirs as officials sought to release pressure on a pair of 70-year-old dams that protect downtown. Water was at risk of spilling around the sides of the barriers, which have a long history of seepage. 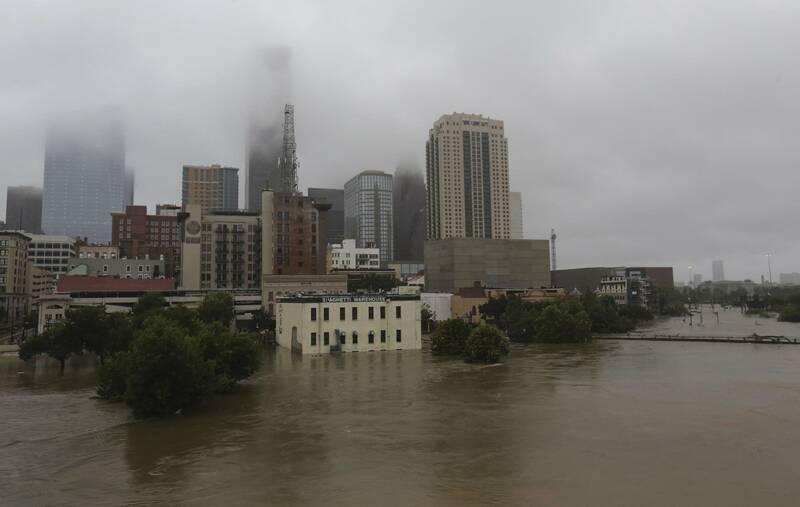 The move was supposed to help shield the business district from floodwaters, but it could also flood thousands more homes. Meanwhile, rescuers continued plucking people from the floodwaters -- at least 2,000 so far, according to Acevedo. At least 185 critical rescue requests were still pending on Monday morning, he said. Rescuers were giving priority to life-and-death situations, leaving many people to fend for themselves. Chris Thorn was among the many volunteers still helping with the mass evacuation that began Sunday. He drove with a buddy from the Dallas area with their flat-bottom hunting boat to pull strangers out of the water. "I couldn't sit at home and watch it on TV and do nothing since I have a boat and all the tools to help," he said. They got to Spring, Texas, where Cypress Creek had breached Interstate 45 and went to work, helping people out of a gated community near the creek. A mandatory evacuation was ordered for the low-lying Houston suburb of Dickinson, home to 20,000. Police cited the city's fragile infrastructure in the floods, limited working utilities and concern about the weather forecast. In Houston, questions continued to swirl about why the mayor did not issue a similar evacuation order. He added, "Can you imagine if millions of people had left the city of Houston and then tried to come back in right now?" The Red Cross quickly set up the George R. Brown Convention Center and other venues as shelters. The center, which was also used to house Hurricane Katrina refugees from New Orleans in 2005, can accommodate roughly 5,000 people. By Monday morning, it was already half full. At the Addicks and Barker reservoirs, the Army Corps of Engineers started the water releases ahead of schedule early Monday because water levels were climbing at a rate of more than 6 inches (15 centimeters) per hour, Corps spokesman Jay Townsend said. When Army Corps officials asked hundreds of residents to evacuate, they explained that the release could flood subdivisions near the reservoirs, which were built after devastating floods in 1929 and 1935. The reservoirs are designed to hold water until it can be released downstream at a controlled rate. One man, Joe Garcia, carried his German shepherd in the chest-deep water before being picked up by a boat. Garcia said he floated out a tub of his belongings, then went back for his dog. Forecasters expect the system to stay over water and at 45 mph (72 kph) for 36 hours and then head back inland east of Houston sometime Wednesday. The storm is then expected to head north and lose its tropical strength. 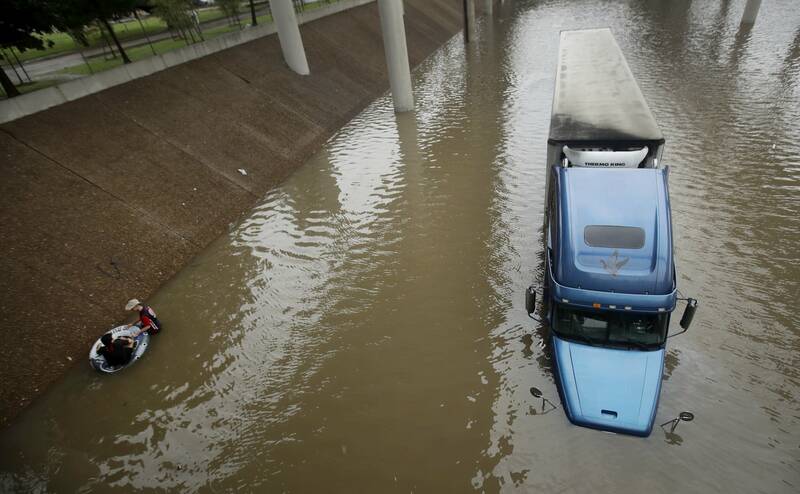 The amount of water in Houston was so unprecedented that meteorologists had to update the color charts on the weather service's official rainfall maps to indicate the heavier totals. In Washington, President Donald Trump's administration assured Congress that the $3 billion balance in FEMA's disaster fund was enough to handle immediate needs, such as debris removal and temporary shelter for displaced residents. Trump planned to visit Texas on Tuesday, accompanied by first lady Melania Trump.